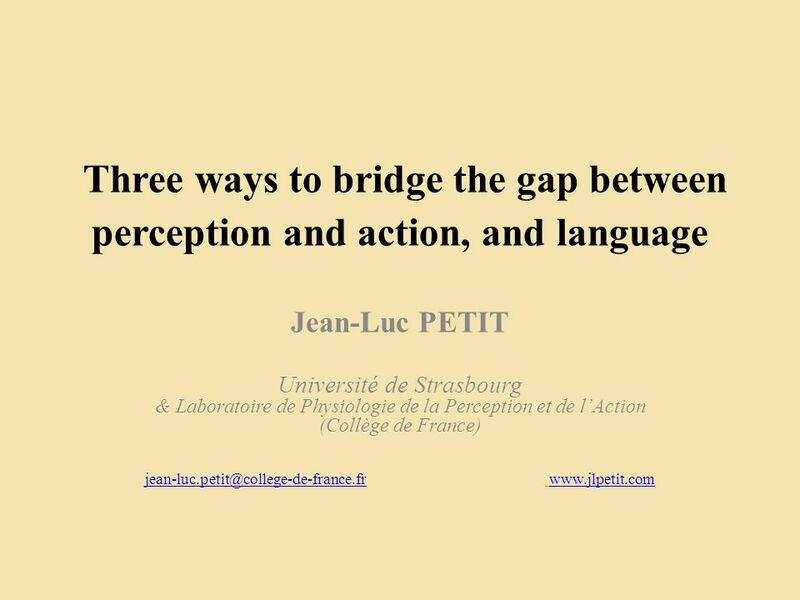 Three ways to bridge the gap between perception and action, and language Jean-Luc PETIT Université de Strasbourg & Laboratoire de Physiologie de la Perception. 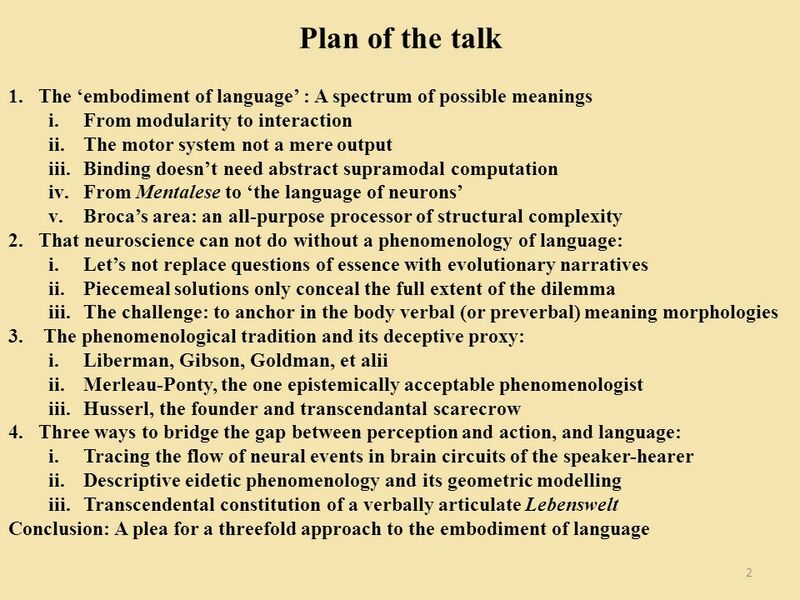 4 The embodiment of language: A spectrum of possible meanings 4 The expression embodiment of language refers to a new trend of research on the neural basis of language. 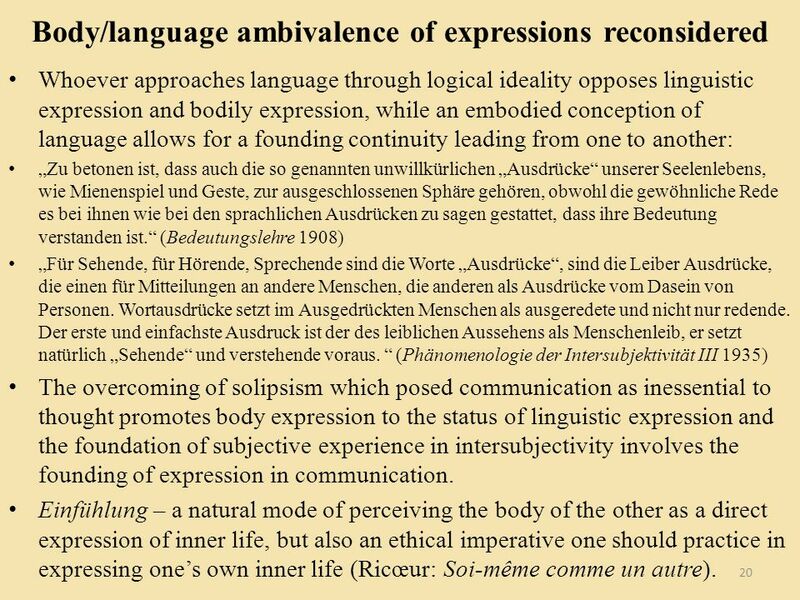 Apart from a convenient label to bring together different research teams, this expression suggests that there is a special relationship between language and the body. The philosophical observer may wonder whether he will find in it the traditional philosophical problem of the incarnation of mind. 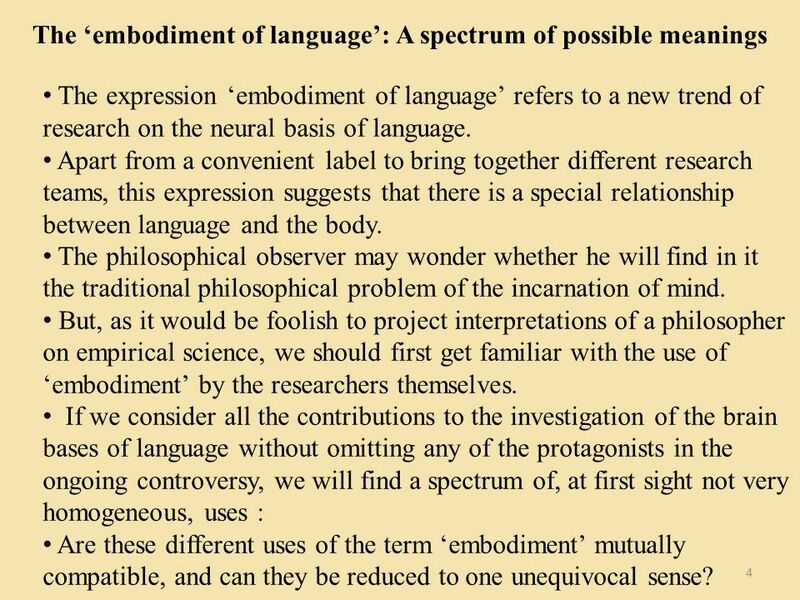 But, as it would be foolish to project interpretations of a philosopher on empirical science, we should first get familiar with the use of embodiment by the researchers themselves. 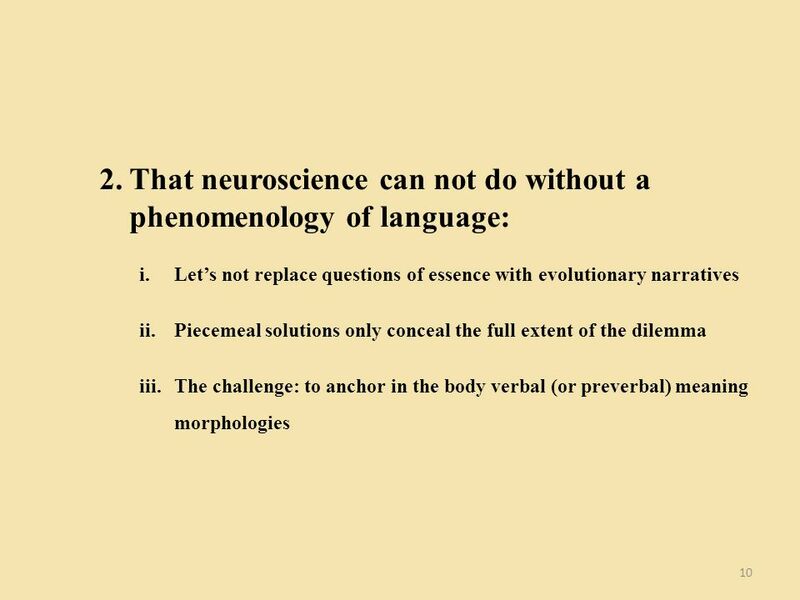 If we consider all the contributions to the investigation of the brain bases of language without omitting any of the protagonists in the ongoing controversy, we will find a spectrum of, at first sight not very homogeneous, uses : Are these different uses of the term embodiment mutually compatible, and can they be reduced to one unequivocal sense? 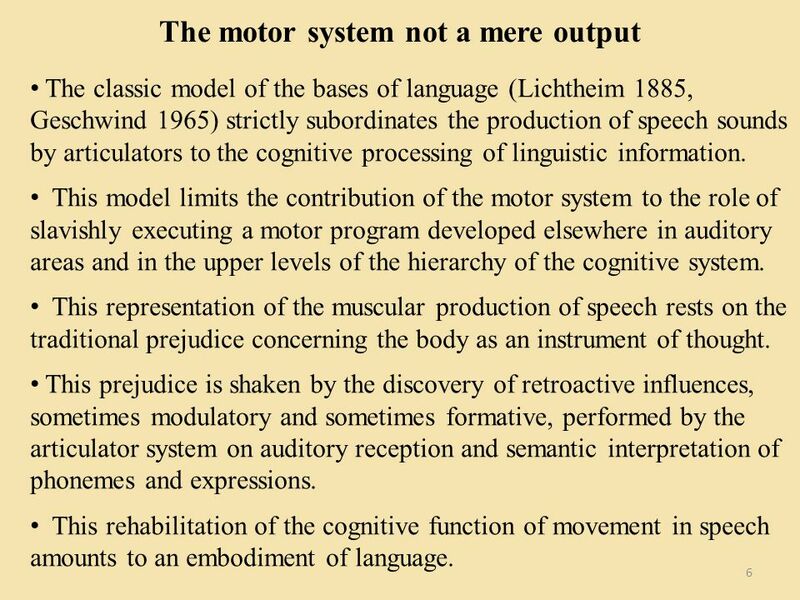 6 The motor system not a mere output 6 The classic model of the bases of language (Lichtheim 1885, Geschwind 1965) strictly subordinates the production of speech sounds by articulators to the cognitive processing of linguistic information. 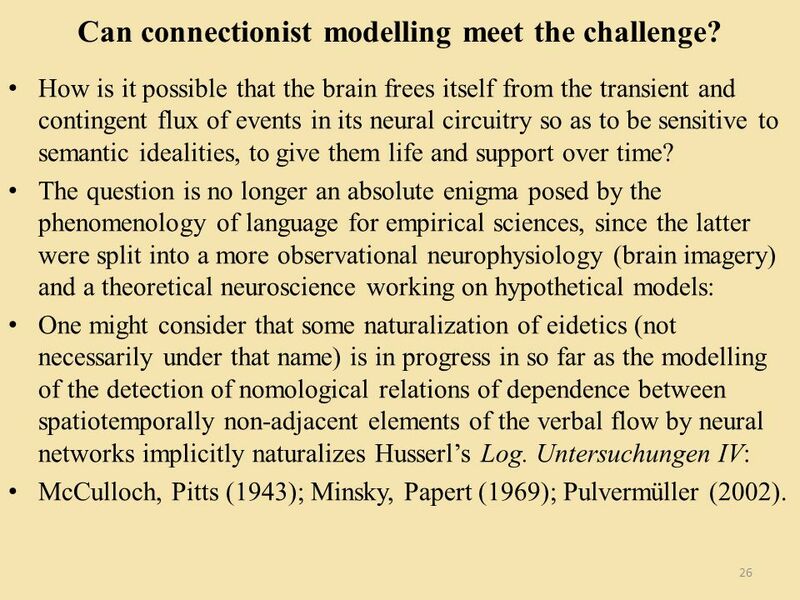 This model limits the contribution of the motor system to the role of slavishly executing a motor program developed elsewhere in auditory areas and in the upper levels of the hierarchy of the cognitive system. 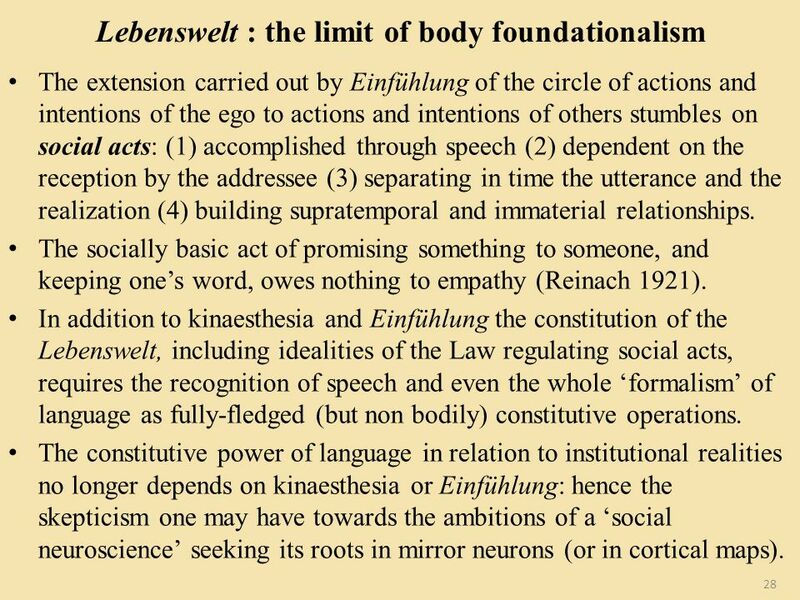 This representation of the muscular production of speech rests on the traditional prejudice concerning the body as an instrument of thought. 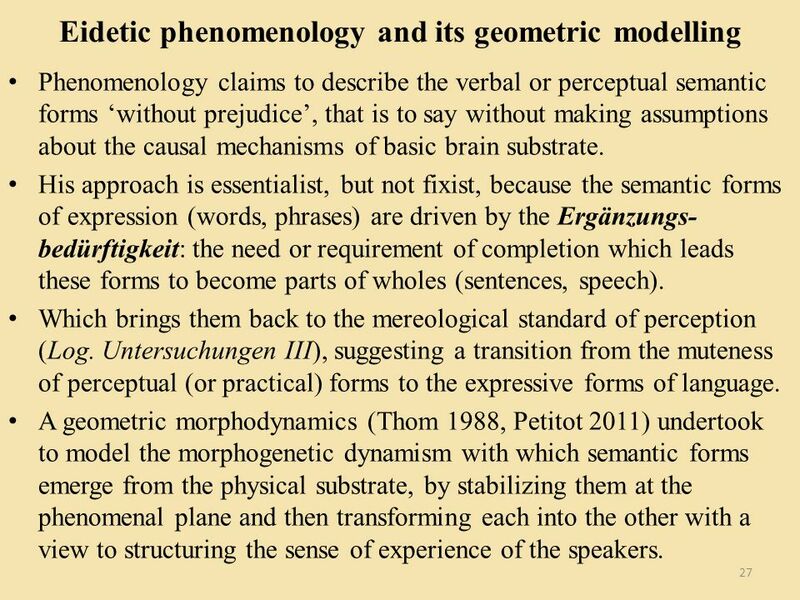 This prejudice is shaken by the discovery of retroactive influences, sometimes modulatory and sometimes formative, performed by the articulator system on auditory reception and semantic interpretation of phonemes and expressions. 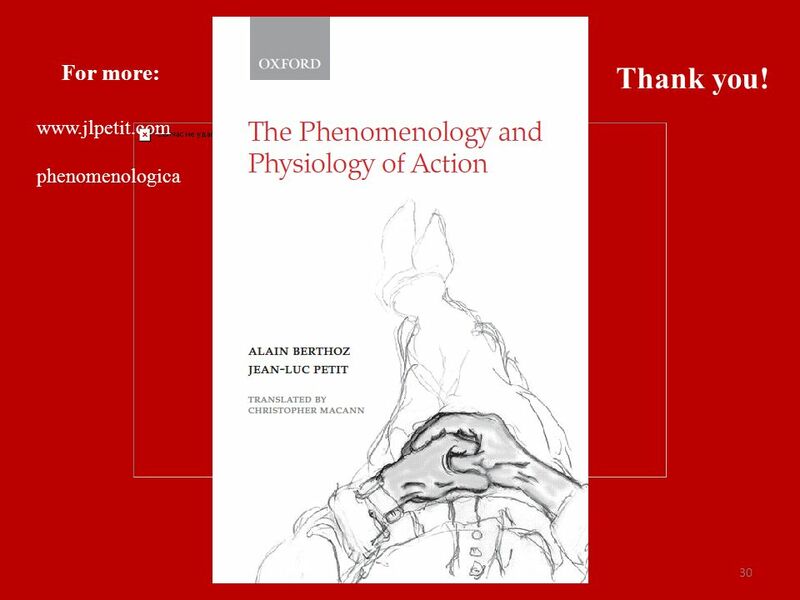 This rehabilitation of the cognitive function of movement in speech amounts to an embodiment of language. 7 Binding doesnt need abstract supramodal computation 7 The synthesis of sensory qualities of perceived objects raises, at the level of the neuron or neuronal group, the problem of binding of unimodal signals of different pathways: visual, auditory, olfactory, vestibular, proprioceptive and visceral in a supramodal concept of the object. 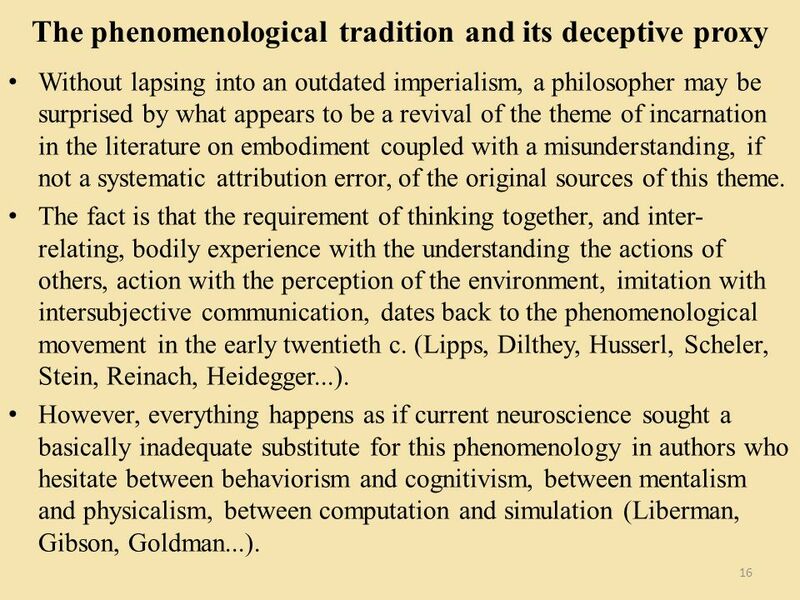 This integration function is classically delegated to a central cognitive system hierarchically superior to the various sensory systems and exerting an influence on their operation, especially through the orientation of attention. 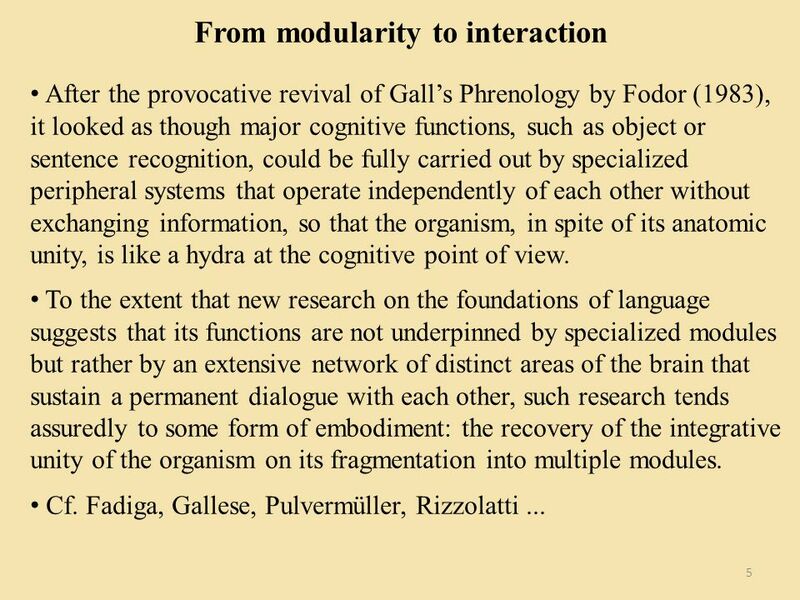 This hypothesis of a purely conceptual, amodal thus disembodied, center is unlikely given the ubiquity of the mixture of influences of the various modalities that occurs at synaptic connections. 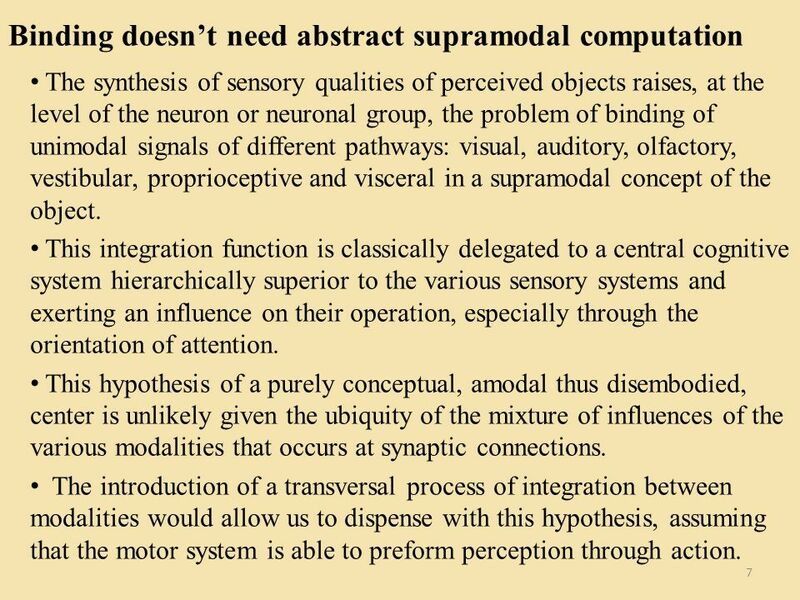 The introduction of a transversal process of integration between modalities would allow us to dispense with this hypothesis, assuming that the motor system is able to preform perception through action. 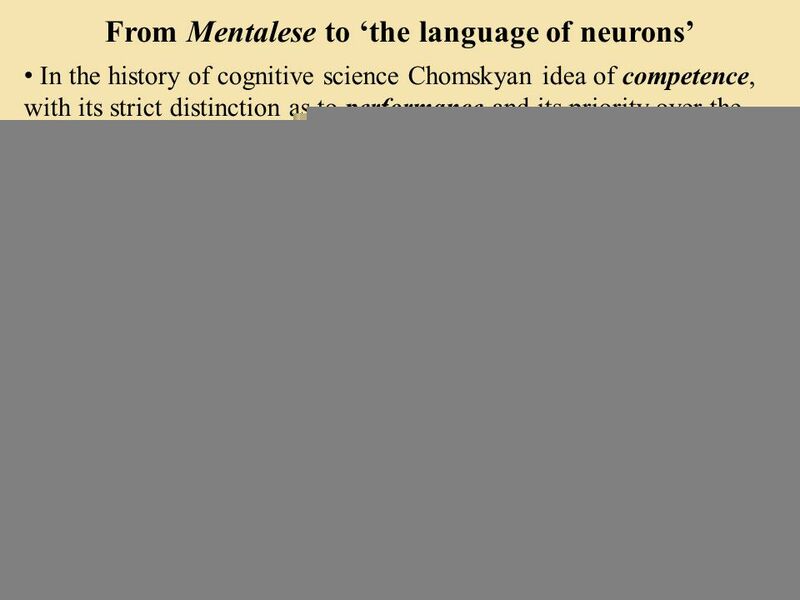 8 From Mentalese to the language of neurons 8 In the history of cognitive science Chomskyan idea of competence, with its strict distinction as to performance and its priority over the latter for the study of language has had a founding role. 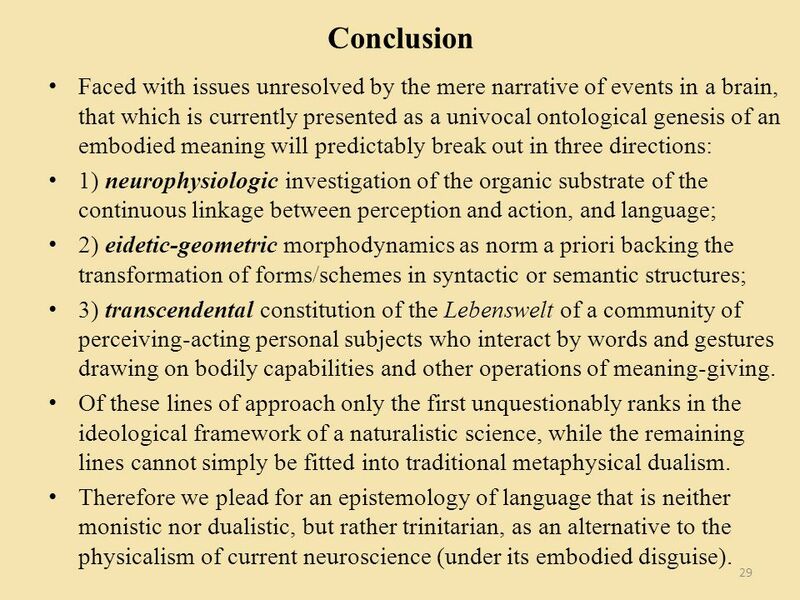 This distinction, and hierarchy resulting from it, tended to assimilate the core structure of the linguistic capability of man to a language of symbolic logic and its implementation to an application of syntactic rules to strings of symbols (a calculus). 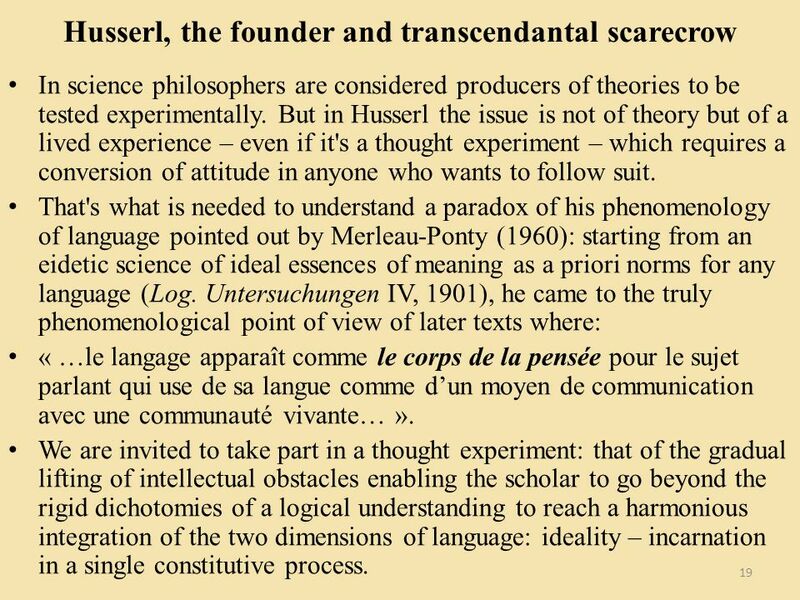 Once the language of thought has been internalized in this deep structure its realization in acts of communication could only appear as a contingent coating surface structure. 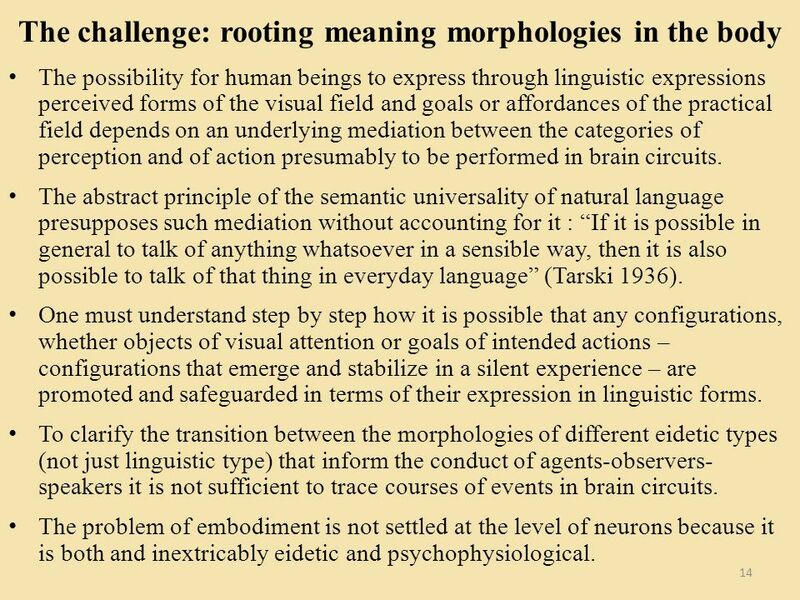 The Mentalese (Fodor 1975) limited the contribution of neuroscience to the study of language to the realization of the logical structure of competence in a brain-machine indifferent to its program. 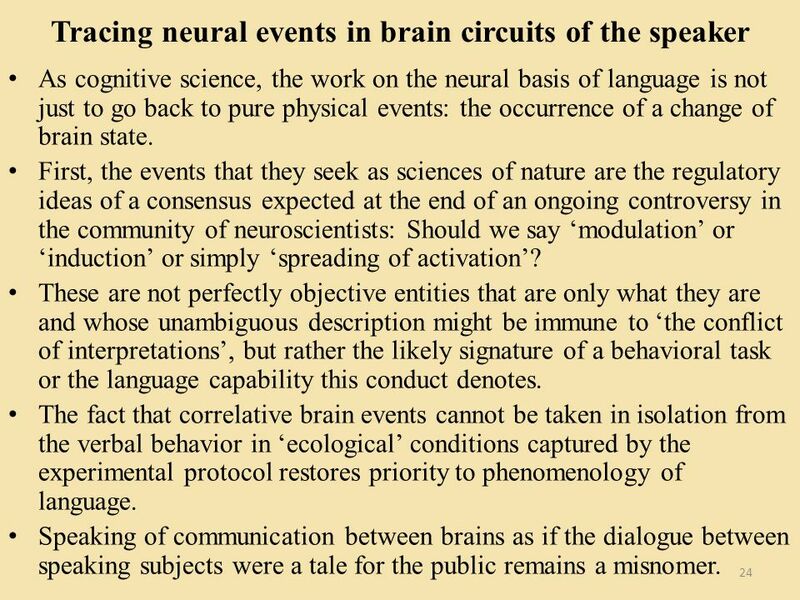 The identification of linguistic information processing with neural dynamics itself and its laws of association is yet another form of embodiment of language (Pulvermüller 2002). 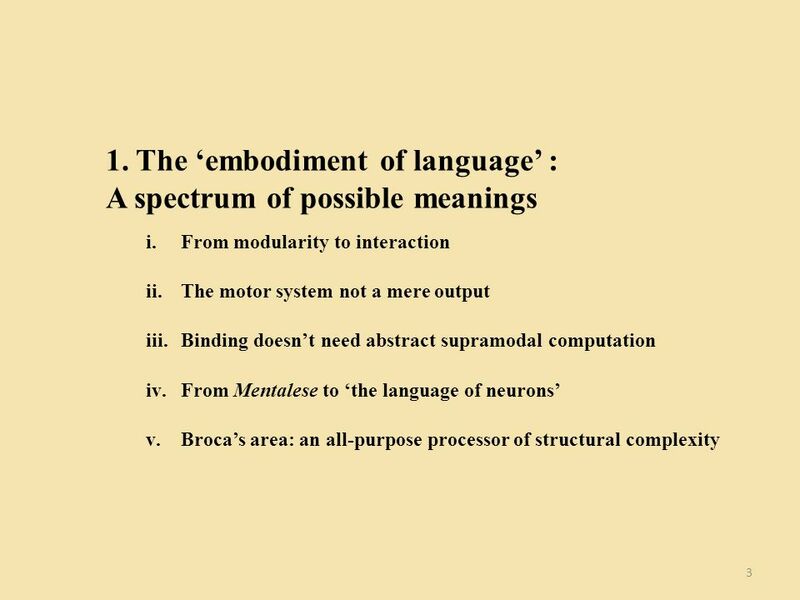 9 Brocas area: an all-purpose processor of complexity 9 Whether converging or diverging, the various trends expressing themselves through the theme of embodiment are represented in the debate on the interpretation of the functions of Broca's area. 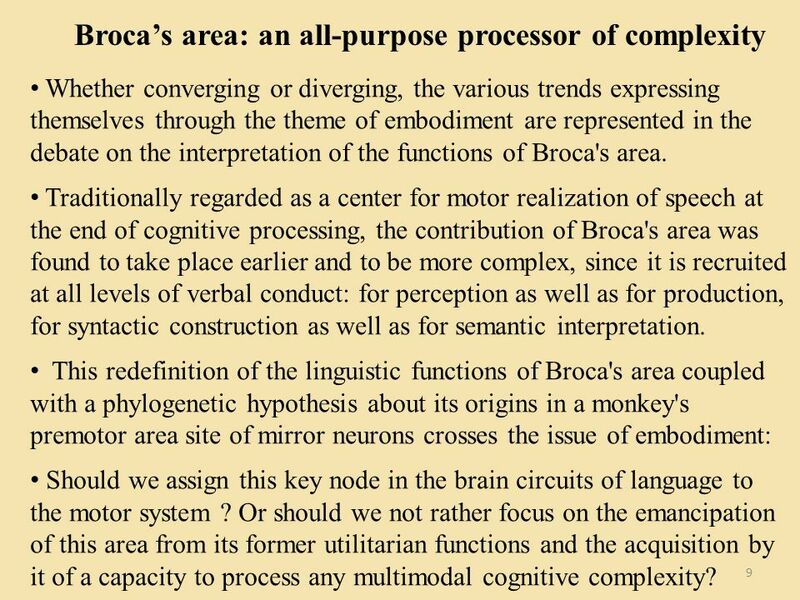 Traditionally regarded as a center for motor realization of speech at the end of cognitive processing, the contribution of Broca's area was found to take place earlier and to be more complex, since it is recruited at all levels of verbal conduct: for perception as well as for production, for syntactic construction as well as for semantic interpretation. 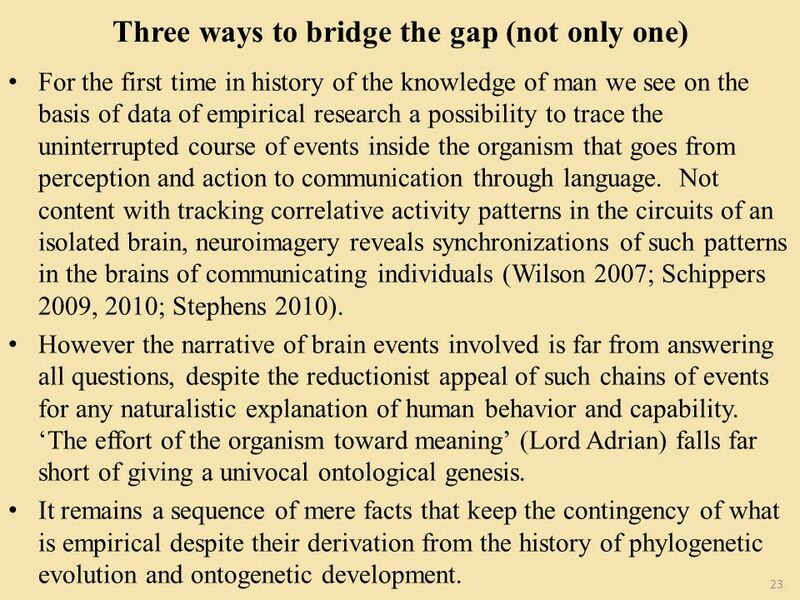 This redefinition of the linguistic functions of Broca's area coupled with a phylogenetic hypothesis about its origins in a monkey's premotor area site of mirror neurons crosses the issue of embodiment: Should we assign this key node in the brain circuits of language to the motor system ? 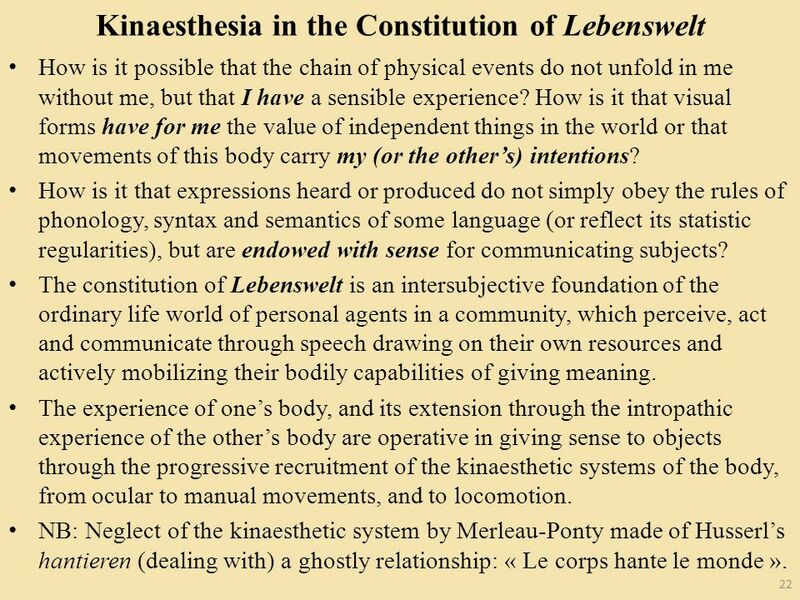 Or should we not rather focus on the emancipation of this area from its former utilitarian functions and the acquisition by it of a capacity to process any multimodal cognitive complexity? 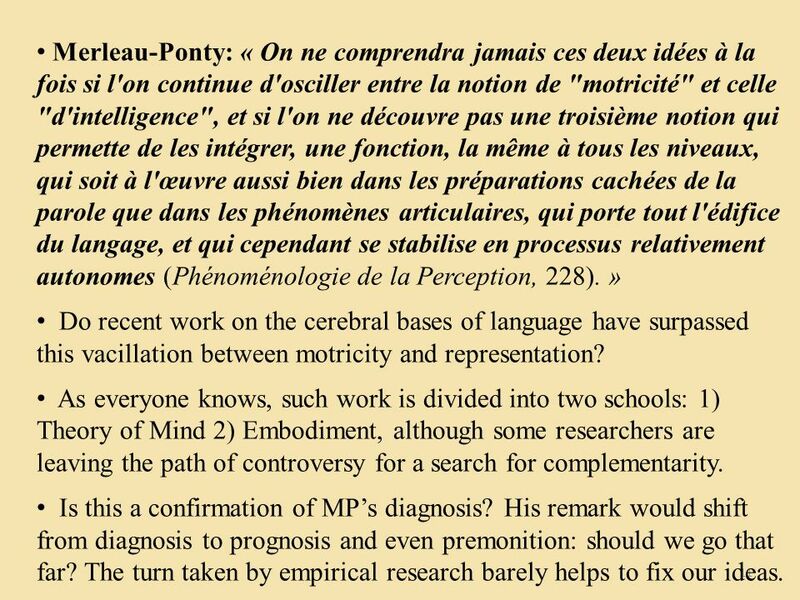 11 11 Merleau-Ponty: « On ne comprendra jamais ces deux idées à la fois si l'on continue d'osciller entre la notion de "motricité" et celle "d'intelligence", et si l'on ne découvre pas une troisième notion qui permette de les intégrer, une fonction, la même à tous les niveaux, qui soit à l'œuvre aussi bien dans les préparations cachées de la parole que dans les phénomènes articulaires, qui porte tout l'édifice du langage, et qui cependant se stabilise en processus relativement autonomes (Phénoménologie de la Perception, 228). 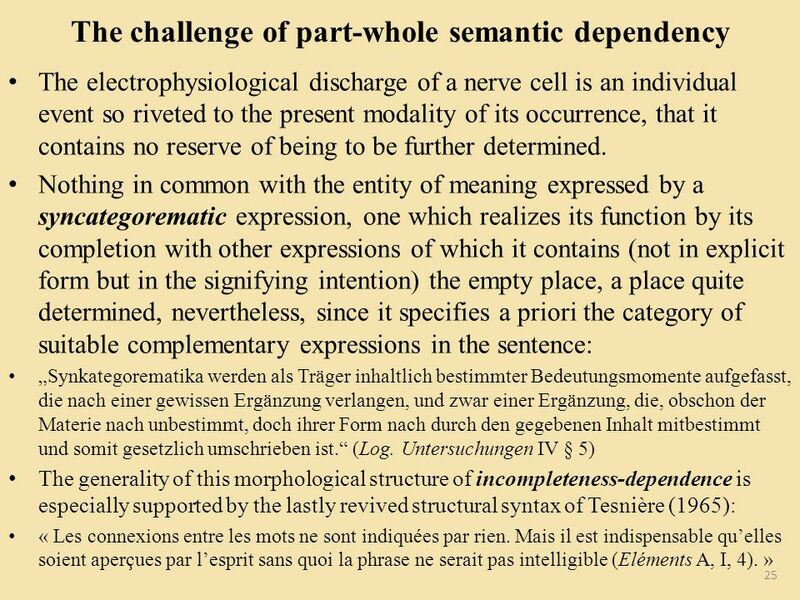 » Do recent work on the cerebral bases of language have surpassed this vacillation between motricity and representation? 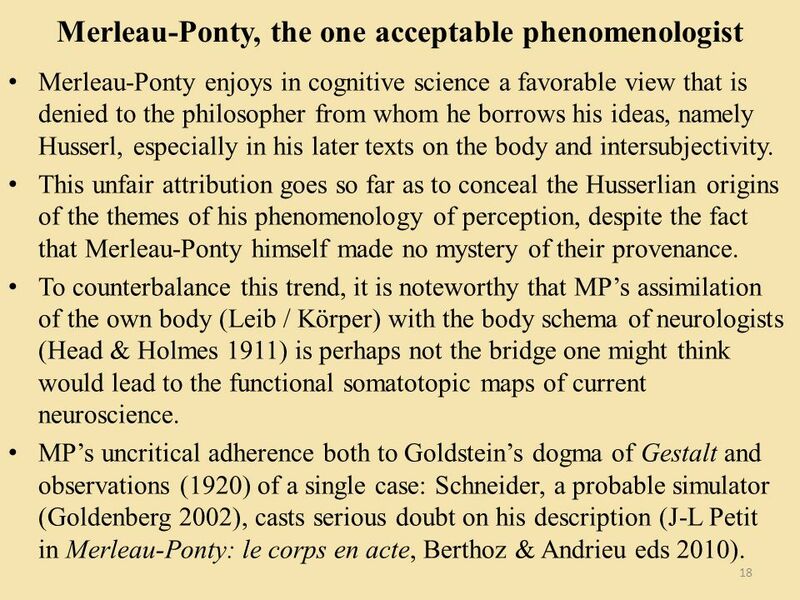 As everyone knows, such work is divided into two schools: 1) Theory of Mind 2) Embodiment, although some researchers are leaving the path of controversy for a search for complementarity. Is this a confirmation of MPs diagnosis? His remark would shift from diagnosis to prognosis and even premonition: should we go that far? The turn taken by empirical research barely helps to fix our ideas. 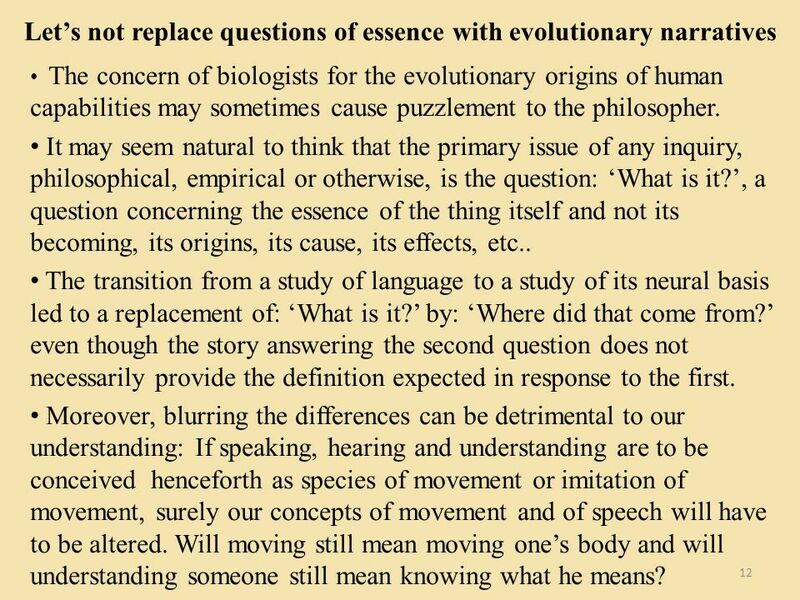 12 Lets not replace questions of essence with evolutionary narratives 12 The concern of biologists for the evolutionary origins of human capabilities may sometimes cause puzzlement to the philosopher. 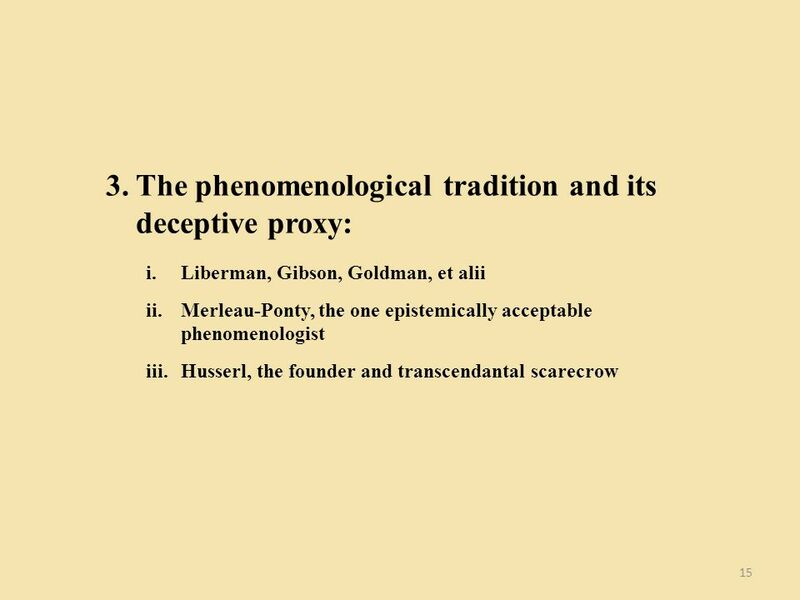 It may seem natural to think that the primary issue of any inquiry, philosophical, empirical or otherwise, is the question: What is it?, a question concerning the essence of the thing itself and not its becoming, its origins, its cause, its effects, etc.. 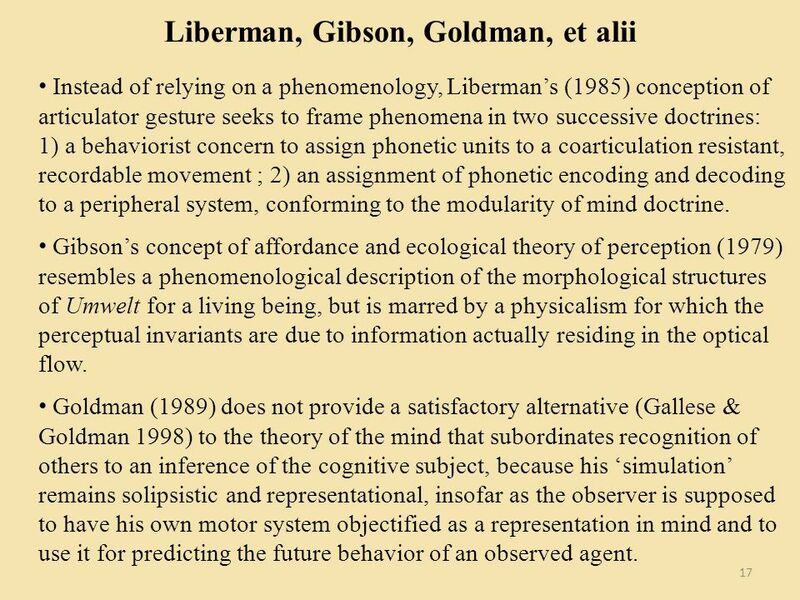 The transition from a study of language to a study of its neural basis led to a replacement of: What is it? by: Where did that come from? even though the story answering the second question does not necessarily provide the definition expected in response to the first. 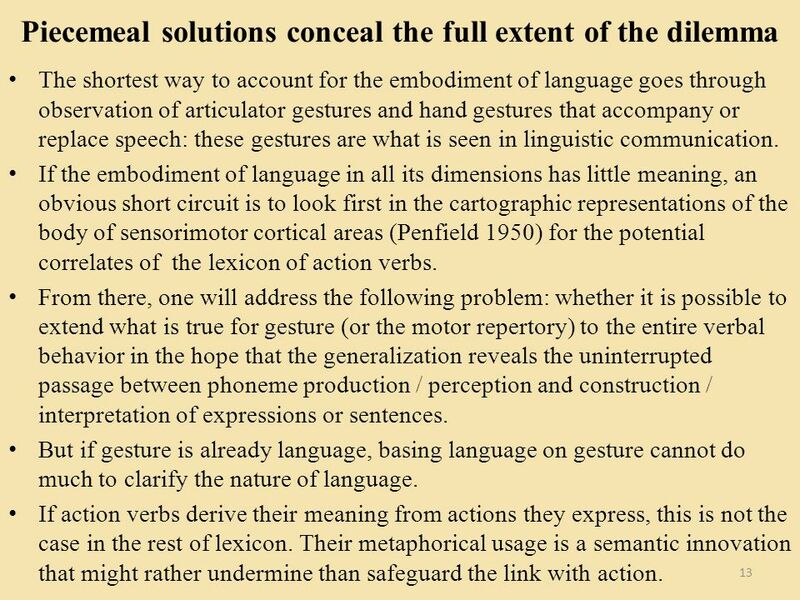 Moreover, blurring the differences can be detrimental to our understanding: If speaking, hearing and understanding are to be conceived henceforth as species of movement or imitation of movement, surely our concepts of movement and of speech will have to be altered. Will moving still mean moving ones body and will understanding someone still mean knowing what he means? 30 30 For more: www.jlpetit.com phenomenologica Thank you! 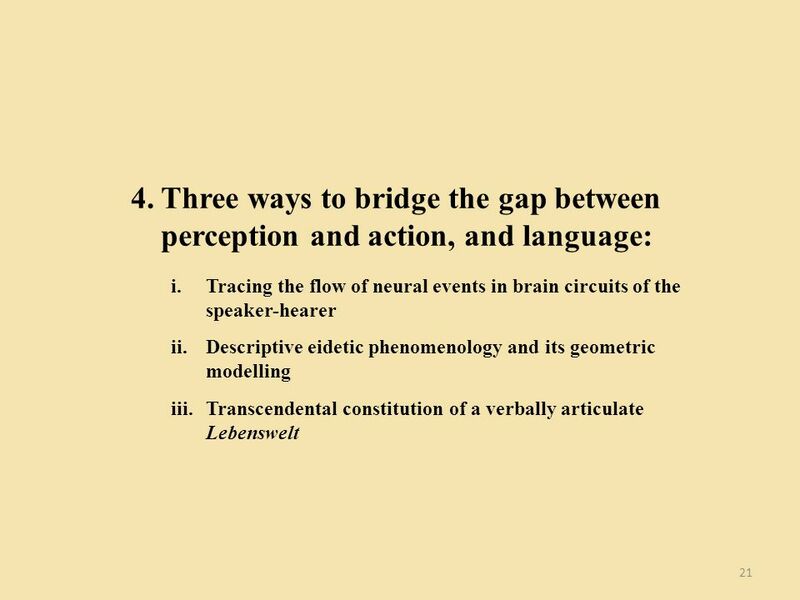 Download ppt "Three ways to bridge the gap between perception and action, and language Jean-Luc PETIT Université de Strasbourg & Laboratoire de Physiologie de la Perception." The Role of AI in the Paradigm Shift towards Enaction Life and Mind seminar #2 Tom Froese. Some ideas …. Task XBRL as a business performance and financial reporting standard (with its various taxonomies). 2. 1 Lecture 4 CONSTRUCT VALIDITY. 2 Validity A test is said to be VALID if it measures what it is supposed to measure. Copyright © 2014 by Educational Testing Service. ETS, the ETS logo, LISTENING. LEARNING. LEADING. and GRE are registered trademarks of Educational Testing. 1 2 Frege's Puzzles; Sense vs. Reference. 2 Teaching Assistants Brenden MURPHY Brenden MURPHY office h:12:00-1:00pm Paterson. Summer 2011 Tuesday, 8/ No supposition seems to me more natural than that there is no process in the brain correlated with associating or with. Philosophical Foundations Chapter 26. Searle v. Dreyfus argument §Dreyfus argues that computers will never be able to simulate intelligence §Searle, on.